Reading a book is different than watching a movie. A book is personal, where an author’s ideas, words and concepts soak straight into the reader’s brain. That’s why people feel so connected to their favorite authors, but a bad experience at a book fair, conference or event can make the reader feel like a five-year-old told that Santa, the Easter Bunny and the Tooth Fairy were in a six-car pileup on the interstate. Bad experiences with bizarre readers can also leave authors in therapy. I’ve been to a lot of these events over the years, mostly in front of the table or podium but occasionally behind it as well. Because everyone has a short attention span on the Net, this will be in two parts. 1. If You’re Not A People Person, Find One. 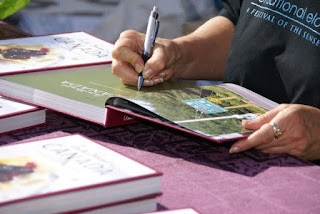 Whoever is behind your book table should be outgoing, friendly and able to talk your work up to potential buyers. If that’s you, then congratulations! Readers love talking directly with the author. If you can’t work your own table or you’re too shy, find someone who’s energetic and will say “Hello” to anyone walking up, not bury his or her head in a book or listen to an iPod and completely ignore browsers. Never leave a table unattended; not only could books disappear, but you never know how many sales were missed. 2. Show Up. If you are speaking at an event and have a table, show up for a signing. Naturally, you’ll get more lining up after your session, so try to land in the chair before a session as well. Your die-hard fans can get some one-on-one time with you before everyone hears your fantastic speech, and the line afterward will flow better. 3. Be Polite. Don’t knock the hotel, trash talk the town, or make fun of the organizers and other speakers. You’re a guest and you might even get paid for this, whether in speaking fees or book sales. Who knows, you just may want to come back sometime. 4. These Are People, Not Dollar Signs. You may see dozens, hundreds, maybe even thousands of people in a day. While they all may blend together to your mind, you stand out to them. Smile, listen if they have a comment and ask if they want the book signed. I will tell you from personal experience that if you take my money, sign a book, thrust it at me and disappear halfway across the room without saying a word before I can even look up, I will never spend my hard-earned cash on your work again. And the book I just bought goes into the library donation box. If you need to take a break, tell people and let them know when you’ll be back. Yes, there are some wingnuts you just need to get away from, but the majority of folks you meet are just there because they like you and want to make that reader/author connection complete. I'm celebrating my tenth year as a freelance writer, and recently I've been thumbing through old clips, queries and other stuff that stacks up in those file folders over time. This made me think: what have I learned in my years of freelancing that I could pass on to new writers? These completely random tips are simple things that paid for themselves, and I hope they can help you as well. This tip was passed on to me when I attended my very first writing conference as a fresh-faced newbie. Although hard copy queries and submissions sent through snail mail are becoming a thing of the past, some markets still insist on the postal method. When you send a SASE, use your own name and address as the return address. If you’ve misjudged the number of stamps required, you’ll still get that response back from an editor, even if it returns with postage due. Under my return address, I’ll add a code (like Re:Grit or Re:SEP for Saturday Evening Post) so I know which publication is answering my query before I open it. Keep a list of your published clips and update it frequently. Your list should include the title of the clip, the publication it appeared in and publication date. Even better, create an Excel spreadsheet for your clips, add in genre (short story, essay, article, interview, etc.) and publication rating (1 for national, 2 for trade, 3 for regional, 4 for local, etc.) so you can sort your list any way you need. This isn’t just for your own record-keeping; publications and other writing gigs will occasionally request this information, and if you keep it up to date, you won’t waste hours pulling it together at the last minute. Some publications accept submissions from their readers as well as from freelance writers. With most of these pubs, submitting as a reader pays far less. When you send a query or submission, be professional. Don’t go on about how many years you’ve read the magazine, or how you would love to see your name in print. Research the magazine so you know which editor should receive your query, prepare your letter in standard business format and present yourself as a professional freelancer. Use standard query language (here is a great primer on queries if you don’t know the basics) and mention your previous writing clips if you have them. I can tell you from experience this means the difference between a $50 check and a $400 check. Acting in a professional manner always pays off in freelance writing.